For some of you who didn't know, as of a couple of months back I set up an art contest on my contest page. 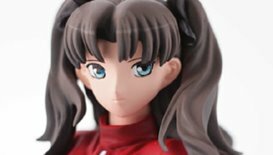 The winner gets a brand new Bome Rin Tosaka figure and their picture in the future Fate/Stay Night gallery! The contest is simple, whoever creates the best Fate/Stay Night fan art wins. The image doesn't have to be that of Rin but of anyone from Fate/Stay Night anime. Email your image here. The contest now officially ends July 31st 2008 with voting of the top images shortly after. I know I've received a few emails of people stating that they are going to enter so once I get your pics, you are in ^_^. Good luck to all who enter.